Four children now living in England who survived a massacre in which almost all of their family were killed have been in court to testify against those accused of the murders. The four, all ethnic Albanians from Kosovo, were among 24 people rounded up by Serb paramilitaries and shot in 1999, in one of the most horrific acts of the entire Kosovo conflict. There is tight security for their court appearance in Belgrade. 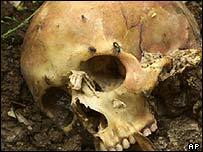 The massacre happened in the village of Podujevo on 28 March 1999. Serb paramilitaries calling themselves "The Scorpions" had ordered members of three families to gather in a garden. They then allegedly murdered 19 people, the youngest just two years old. Despite serious injuries, five children survived, the only witnesses to the crime. They have spent the last four years living in the north-west English city of Manchester, but earlier this week they flew back to Serbia to face one of the killers in court. Policeman Sasa Cvjetan, whose trial started in October, has been charged with war crimes against civilians - an allegation he denies. Another officer, Dejan Demirovic, is being tried in absentia having fled to Canada. The case is so sensitive the court was closed to journalists and members of the public. Prosecutors feared the children might be too afraid to testify in open court, also that their lives might be in danger. One witness is crucial: a 13-year-old girl who says she watched as the defendant pulled out his gun and shot her mother dead. For one of the five it has already proved too much. Ten-year-old Genc said he could not cope. He was flown out of Belgrade within hours of arriving.